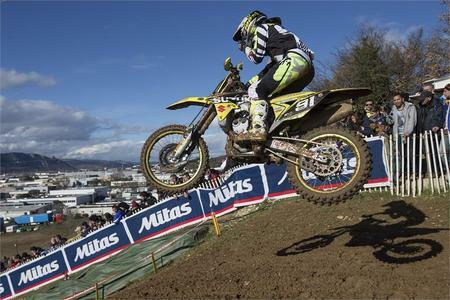 Team Suzuki World MXGP and MX2 team riders Kevin Strijbos and Jeremy Seewer raced to podium positions at yesterday’s Valence International Motocross in France. Track conditions were tough following poor weather during the last few weeks, but Strijbos put the RM-Z450 into third place in the MX1 class and Seewer his RM-Z250 to a second place overall in MX2. Suzuki World MX General Manager Stefan Everts was positive about Strijbos’ day. “I have seen some good things today, but his riding in training was even better. We need to try and get that same level at the races for him. I know he is good, he rides some of the fastest laps, but he needs to complete the task,” Everts said. Strijbos rode to a third place in Moto 1 and 2 and finished third overall. He also finished third in the Super Final. 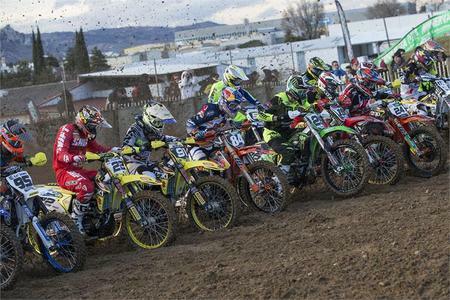 Team-mate Ben Townley again made progress riding in European conditions. “Coming back to Europe is not easy and the conditions are tough. It has been quite a challenge each weekend but I’m improving every race. I started quite slow, I couldn’t follow the fast guys in Moto 1, but I got more used to the track in Moto 2 and could stay with them for some laps,” Townley said. The New Zealander finished both moto’s in fourth position. Townley had a good start in the Super Final, battling with Shaun Simpson for first place. Then Jeffrey Herlings made a block pass which resulted in Townley crashing and having to pull-out. Team Manager Everts was not happy with the incident. “The pass on BT by Herlings was unnecessarily aggressive. It’s a pity to see that things like that happen as BT hurt his knee. There are already so many injured riders and the season hasn’t even started yet. A little respect between riders is not misplaced. At the moment, we do not know how serious it is for Ben, but we will wait and hope for the best,” Everts added. Suzuki World MX2 riders had a good weekend with Seewer coming in second in the first moto and third in the second moto which led to a solid second overall. “I’m happy with my weekend. There are always some small things we can improve, but it was a good solid weekend. 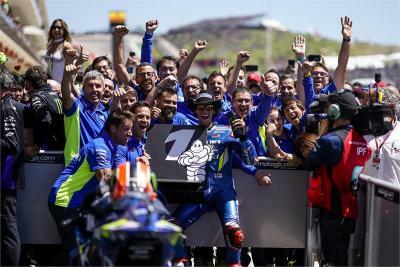 I had some bad luck in the Super Final with a stone hitting my throttle cable and jamming it stuck, but I had a very good feeling in the race,” Seewer said. The Swiss came home seventh in the Super Final. Bas Vaessen had mixed feelings after his weekend. “Training went good but I was slow and not as focused as I could be, overall there was some good riding. In the Super Final I crashed and was dead last but I came back to a 13th place so I’m very happy about that. I’m still satisfied with my weekend, we again made progress on this kind of track and I have to say thanks to my top mechanic,” Vaessen said. Everts remained positive. “He had a very good day and learned a lot, especially on a track that doesn’t suit him as well. His race speed still needs to come up and he needs to be more consistent but I’m super-happy with his effort.” Vaessen finished seventh in Moto 1, eight in Moto 2 and was 13th in the Super Final. It was the first time that all team members where at the race with full race set-up. “It was a buzzy weekend, it was a lot of fun and everyone gave 100%. I’m very happy with my team and looking forward to the first MXGP race of the season,” Everts concluded. The opening race of the 2016 MXGP and MX2 World Championships will be held at Losail International Circuit in Qatar on February 27th.